Bio: In the years following his graduation from the York Academy of Arts in 1970, Bob Rohm entered into a career in film and video production, starting as a camera assistant and eventually running his own production company. The demands of this business led him to stop painting altogether for nearly ten years. Rohm's return to painting was triggered in early 80's when he moved from the North-East to Texas. Bob began to cut back on his production business in order to paint part time, and, in a few short years he became a full time artist. Publications: The Painterly Approach, North Light Books, 2008. 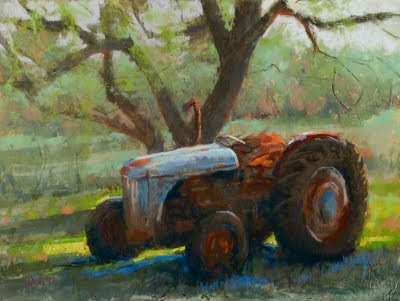 Style: "Although my work is representational, I simplify textures and surfaces to dramatize planes of light and color. My use of color is impressionistic and expressive. I contrast both hard and soft edges, as well as transparent and opaque paint." Gallery: Two galleries, landscapes, and figures. These lead to thumbnail pages. Demos: No, but he lists his materials and supports.